On arrival at Lusaka International Airport, you will be met and assist by our representative and then check in for your flight to Mfuwe, South Luangwa. The flight is on average one hour. At Mfuwe International Airport our guide will meet you. Drive to Nkwali Camp is 1 hour through colourful local scenes of villages, agriculture as well as bush. Nkwali Camp has a wide view of the Luangwa River. On Robin’s private land, and overlooking the South Luangwa National Park, Nkwali is ideally situated for the start of your safari. The six rooms all look out over the river and have open air bathrooms. Depending on your arrival time in the day you will enjoy a lunch looking out over the lagoon to the back of Nkwali or if in the afternoon for tea and the afternoon and night game drive. At dawn breakfast is served around the campfire. The porridge heated on the fire and toast cooked by the coals. The morning walk or drive will leave soon after, entering the park by boat from the camp or by the nearby pontoon. The game in the area is excellent – and includes many family herds of elephants and the endemic species of giraffe, the Thornicroft Giraffe. A mid morning break of tea, coffee and cake will be taken at a scenic point on a lagoon or the Luangwa River. Return to camp for lunch around mid day. After lunch you can cool off in the swimming pool or siesta. Following tea you will go out on an afternoon game drive that continues into the early night giving the chance to see the nocturnal world, returning to camp about 20.00 hrs with dinner generally at 20.30. After an early breakfast, a transfer game drive through the park into the Nsefu Sector of the park and onto Nsefu Camp. Nsefu was the first game camp in Zambia and dates back to the early fifties. The Nsefu Sector was recognised then as a phenomenal area and it still is. Robin Pope Safaris owns the only two camps in this sector of the Park. There are six round rondavels with luxurious en suite facilities and each room has a clear view of the sweeping bend of the Luangwa River through large windows and from the wooden verandahs. On arrival you will be shown to your rondavel and then lunch will be served followed by a well deserved siesta before the afternoon and evening game drive. (Note: option of booking Tena Tena for the 3 nights). After an early breakfast, transfer to Mfuwe Airport (1.5 hours) for the flight to the Lower Zambezi. As you fly into the area, you will see the wide Zambezi River, dotted with islands. Buffalo and elephant are always seen feeding along with the pods of hippos that rest on the edge of the sandbanks. The transfer to Chiawa Camp is through the park and there is the chance of game viewing along the way. Resting on the banks of the Zambezi under a lush grove of mahogany and acacia trees, eight spacious tents on elevated wooden platforms with en-suite facilities offer Chiawa’s guests ample comfort and stunning views. Game-viewing in the pristine Lower Zambezi National Park is superb and big game, such as elephant, hippo, buffalo and the big cats are even seen regularly in and around the camp! After a late lunch there will be a chance for an afternoon activity – be it on the river or by vehicle. Today (usually in the morning) you will take a flight transfer onto Livingstone via Lusaka (1.5 hours’ flight). On arrival you will be met and transferred to Tongabezi Lodge where you will settle into your accommodation and be served a delicious lunch. Accommodation at Tongabezi Lodge is set in a tranquil grove of ebony on a sweeping bend of the Zambezi River, and consists of colonial-style river cottages and spacious open-planned stone and thatch houses. There is a wide range of activities on offer at Tongabezi including fishing, canoe trips on the river, game drives in the Mosi-Oa-Tunya National Park. For the more adventurous, Livingstone boasts a whole host of adrenaline filled activities including whitewater rafting, bungee jumping and microlighting. Or you may just wish to rest in camp and enjoy the spectacular scenery and peaceful atmosphere. After breakfast you may have a morning activity, time permitting or a transfer to Livingstone Airport for your onward connection. • Arrival and departure airport transfer. • Accommodation as per the itinerary. • Road transportation in custom made safari vehicles. Just give us the Safari Tour Code and name of the safari you want to book and we shall revert back with costs and availability. Blessed with awe-inspiring natural wonders, an abundance of wildlife, huge water bodies and vast open spaces, Zambia offers unforgettable holidays exploring the real Africa. Zambia is regarded as one of the most beautiful, friendly, diverse and unspoilt countries on the entire African continent. Aside from the majestic Victoria Falls, Zambia has more natural water resources than any other southern African country, including a myriad of other falls dotted across the country, not to mention the famous Zambezi River. The many National Parks offer great opportunities for observing Africa’s plains game and their attendant predators, whilst bustling urban areas offer a taste of eclectic Zambian culture. Discover the wealth of stunning destinations this friendly country has to offer. Not to be missed are the spectacular views of the magnificent Victoria Falls, followed by a safari. Zambia’s game reserves provide pristine sanctuary to a wide variety of wildlife, and boast some of the best game viewing opportunities in the world. From the North and South Parks on the hippo and croc-infested Luangwa River, to the wide expanse of the Lower Zambezi, the vast and little-explored Kafue. As if all the lakes and waterfalls weren’t enough, Zambia is also home to the magnificent Zambezi River as well as the Luangwa and Kafue river systems, offering great fishing opportunities, adventure activities and canoeing safaris. These are some of the most unspoilt and best-protected rivers on the continent and are home to much of Zambia’s wildlife. Whether it’s the history and sheer size of Lake Tanganyika (the world’s longest lake) that draws you, getting off the beaten track at Lake Mweru, or taking in the secluded beach holiday atmosphere that can be found on the banks of Lake Kariba. While Victoria Falls, not surprisingly, tends to steal the limelight, Zambia has an array of wonderful waterfalls, cascades, rapids, cataracts and flumes on the many rich waterways that dissect the country. Blessed with awe-inspiring natural wonders, an abundance of wildlife, huge water bodies and vast open spaces, Zambia offers unforgettable holidays exploring the real Africa. 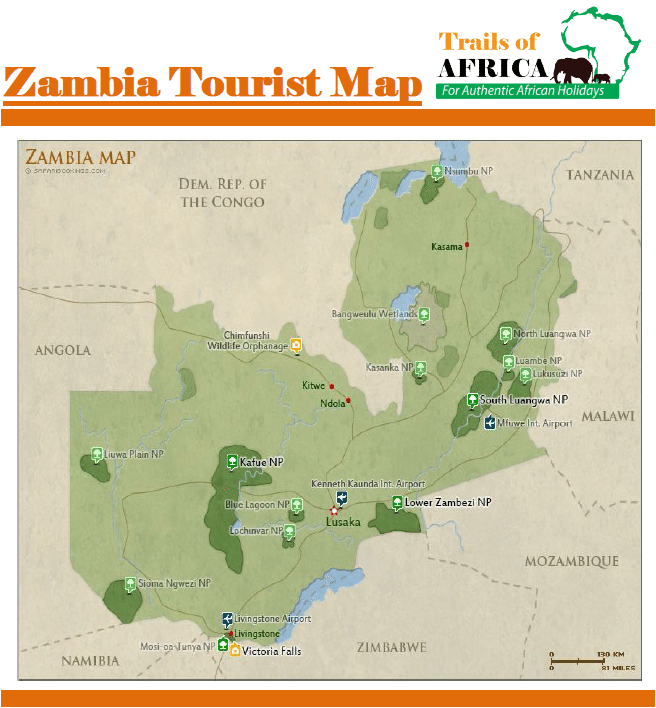 Zambia is regarded as one of the most beautiful, friendly, diverse and unspoilt countries on the entire African continent. Aside from the majestic Victoria Falls, Zambia also has the famous Zambezi River and eclectic Zambian culture. The many National Parks offer great opportunities for observing Africa’s plains game and their attendant predators. Discover the wealth of stunning destinations this friendly country has to offer. © 2018 Trails of Africa Safaris. All Rights Reserved. Download 2019 safari catalogs for East and Southern Africa Destinations. To receive our periodical Safari Newsletter and special offers in future.